City dwellers experience all kinds of conveniences like living in close proximity to workplaces, having easy access to establishments like shopping malls, grocery stores and restaurants where they can purchase their needs, and being able to utilize technologies in the areas of telecommunications, transportation, entertainment, and the internet. Despite these, however, urban dwellers have been observed to experience higher levels of stress and anxiety in their environment compared to those residing in more rural settings. The endless presence of grey concrete streets and buildings, trash, potholes, smoke and smog, the element of crime, and the dense populations in the cities contribute to the stress. In addition, some studies say that this could even lead to heart problems and changes in mood and in the brain (and consequently, mental health disorders). Physicians and scientists have pinpointed the lack of green spaces as a major factor in the creation of stress. When a person sees (or even just spends some time nearby) a vacant lot, cleaned of trash and debris and filled with grass, trees and other plants, along with low wooden fences, the person’s heartbeat drops to about 15 beats per minute. The greener beautified space helped provide people with a sense of calm as well as a boost in self-control and optimism. Because not all city dwellers may have access to places like parks where they can carve out some time simply enjoying the natural surroundings at certain points in their days, there are other ways to find some stress relief. One of the recommended techniques for them to consider is guided imagery. Guided imagery techniques, which also refer to visualization and imagery, call for creating a detailed mental image of a peaceful, attractive environment or setting that can help a person reduce stress levels. Since green spaces are known to help induce calm and relaxation, bringing up images of attractive natural environments can do much to bring peace and calm to a person’s life. When going through guided imagery methods, you are essentially training your focus onto something other than the source of your stress. The images you conjure will then suggest to your unconscious mind and your body that you are within a safe, beautiful and peaceful place, so it will then think that the relaxing environment is real. With guided imagery, there’s no need for special equipment, but you will need a particular space where you can mentally concentrate without interruptions, stimulation or distractions. In this dedicated space, you can shut yourself off from the hustle and bustle of the city and immerse yourself in visualizations of calm green spaces. It’s a form of meditation wherein you involve all your senses in creating the mental picture that will bring up the sensations of calm and relaxation. 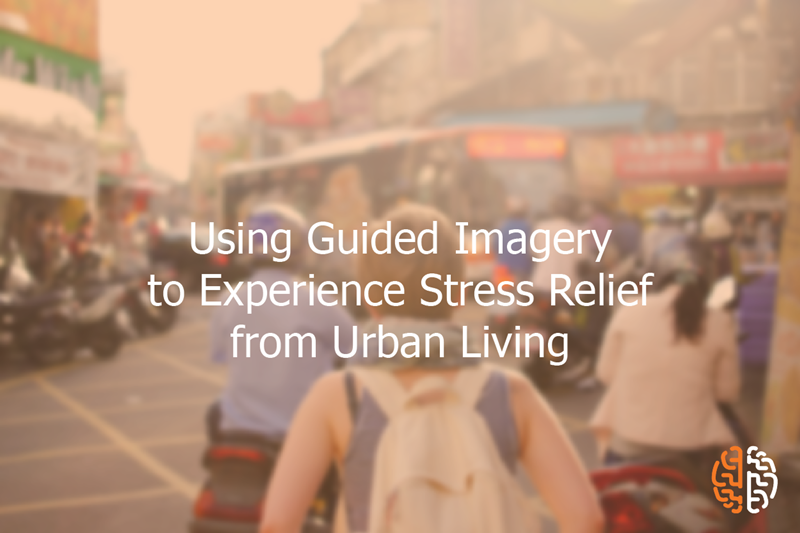 Guided imagery techniques can help urban dwellers find the peace and quiet that would help them manage their stress levels and go through their daily routines in a much calmer and stress-free state. I love this! I’m always looking for new ways to help my clients with stress relief and I can’t believe this is the first time I’ve heard of guided imagery! I’m gonna try it out asap.